Five weeks ago, the North Marion football team limped into league play with an 0-3 record after being outscored 132-14. On Friday, the Huskies marched away from Cascade High School raucously celebrating a 10-0 victory that clinched the team's first back-to-back conference titles in program history. It's a remarkable turnaround for a Husky team that entered the 2017 season with a sophomore-heavy roster that looked in store for a rebuilding year after finishing the previous season in a three-way tie for the Oregon West Conference title. But after opening the season with two big losses in their first three games, North Marion (4-4, 4-1 OWC) galvanized itself and made an abrupt about face, turning into one of the stingiest defenses in the state in the past month of football. "This speaks to the resilience of our guys," North Marion head coach Doug Bilodeau said. "The first three weeks a lot of guys could have quit. A lot of people would have said they were done, but these guys didn't." Friday night's shutout over the Cougars (5-3, 4-1) was only the most recent in a five-game stretch of impressive performances. 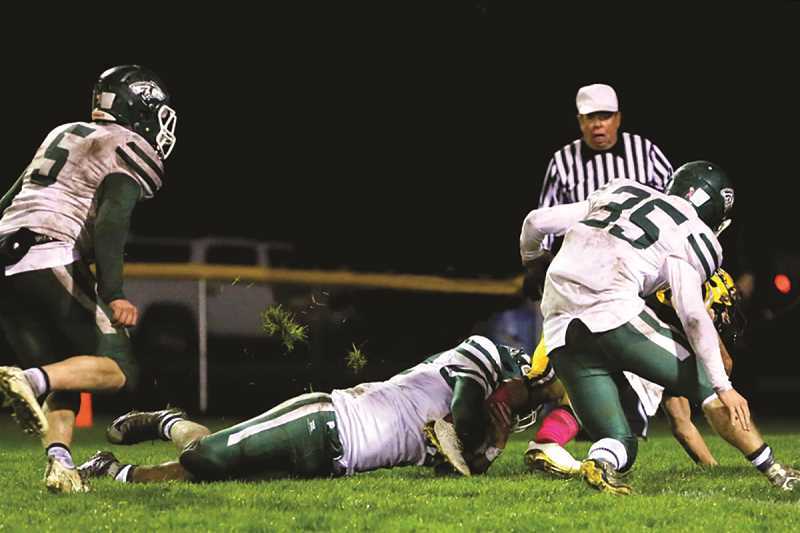 Both teams entered the game looking to secure outright possession of the Oregon West league title after splitting it equally last year with the fellow rival Stayton Eagles. 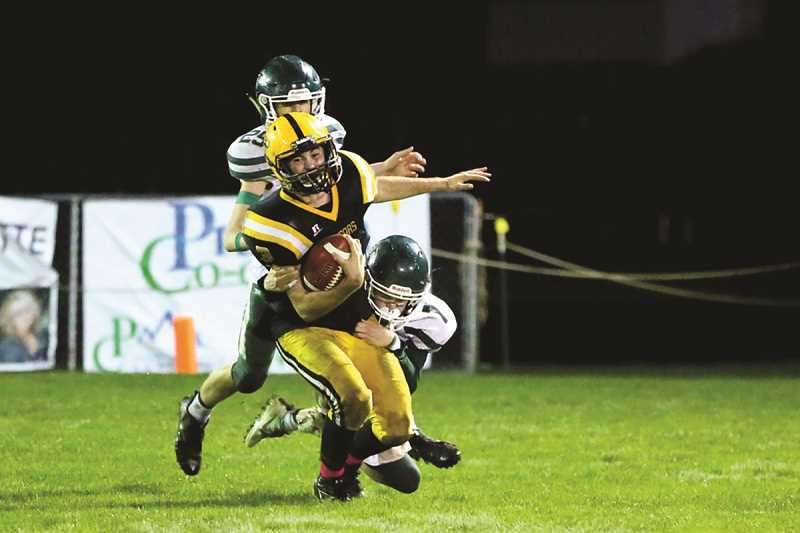 The Cougars possessed the better resume on paper, stomping through the first four games of the league schedule with relative ease, while the Huskies were coming off their first league loss in the week before against the Eagles. It quickly became apparent after the opening kickoff that the Cougar team that had averaged more than 44 points against the other four Oregon West teams was in for a different experience against the Huskies. The two teams traded blows and turnovers in a contest of dueling defenses. The Huskies forced five takeaways, picking off the Cougars on three occasions and coming away with a pair of fumbles as well. Meanwhile, the Cougars forced five of their own, forcing four fumbles and an interception. The difference came between the 20s, where the Huskies were able to consistently drive the ball deep into Cougar territory, forcing their opponent to play at or near their own goal line. That paid off in the second quarter when defensive tackle Rogelio Ramirez came up with the first points of the game on a safety that put the Huskies up 2-0 heading into halftime. The Huskies added a touchdown in the third quarter on a 15-yard run by Brandon Weaver, but a missed point-after attempt kept it as a one-score game at 8-0. But the Husky defense wasn't done. With the final quarter counting down, sophomore Joe Ledesma came up with the defensive line's second safety of the game, putting an exclamation point on the win. Weaver led the team with 10 carries for 71 yards and the lone touchdown of the game, while senior Sam Garcia had a game-high 73 rushing yards on 18 carries. Brady Hansen led all receivers with three receptions for 59 yards. Meanwhile, the North Marion defense came up with its second shutout in the past three games in a dominating run through the Oregon West Conference. The Huskies have held league opponents to just 9.6 points per game and have forced 21 turnovers in the past five games. "Our defense is prolific like that," Bilodeau said. "They're really getting after it." While this is the second consecutive league title for the North Marion football team, this year's honor is much more significant. Last year's team shared the title with Stayton and Cascade after all three teams finished with 3-1 records and had each one and lost to each other. 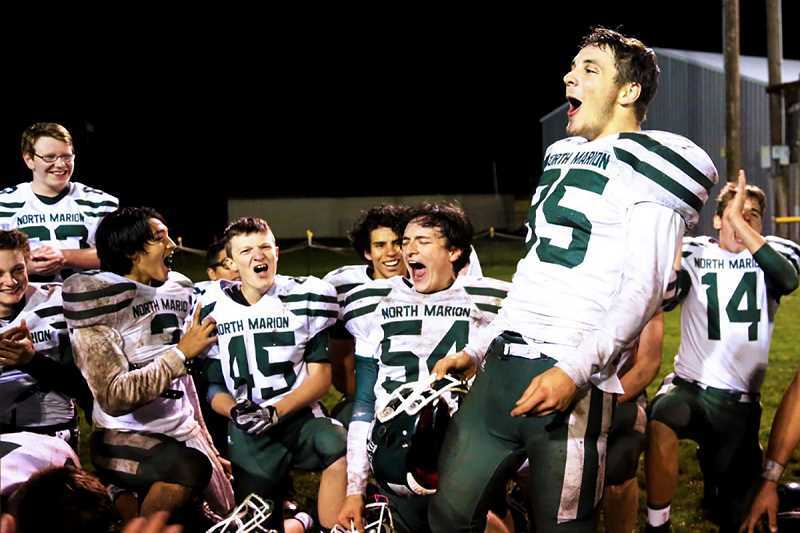 This year's Husky team and Cascade each finished the regular season with 4-1 records, but North Marion wins the league title outright by virtue of the tiebreaker from Friday's shutout victory. That title comes with play-in bye, which is welcome news after last year's team was forced to play on the road in a play-in game despite winning their share of the Oregon West crown. The downside is that due to North Marion's low ranking in the OSAA polls, they'll almost certainly be playing their first round game on the road against a highly-ranked team. "It's fine; it doesn't matter," Bilodeau said. "Whether you're on the road or not, you gotta play." The Huskies will take a week off to prepare for the coming first round game on the weekend of Nov. 3 against an opponent to be determined. In the meantime, they'll be enjoying a rare week off as the team looks to get as healthy as possible for the postseason. "Recovery right now," Bilodeau said. "It's that time of year — the kids are banged up. We'll get after it again come Monday and have a game plan."